Current is a merchandising company that sells over 2000 different products. What makes this company unique is that their products have a genuine, warm and loving feeling to them. If you are looking for a place to find one-of-a-kind presents, cute greeting cards and many other lovable treasures for those special people in your life, then look no further. Orin and Miriam Loo are the founders of Current, which they set up in 1950. Miriam believed that Orin, who at the time was an artist and pressman, could use the postcards he created as a successful fund raising product. Miriam's intuition turned out to be accurate, and soon after the pair released an entire catalog filled with their exquisite greeting cards and various other products. Current Catalog is a beautifully designed website, which has all of their products neatly organized into headings, making it very easy to navigate through. If you know exactly what you are looking for, you can type in the keyword or item # in the search bar located at the top, for your convenience. If you aren't too sure what you are looking for, or you just want to browse, you can roll your cursor over any of the headings, at which point you will see a drop down menu of the subcategories the products have been categorized into. They have a separate heading dedicated solely to all items on sale, which makes it very easy to find affordable products quickly and effortlessly. Additionally, there are icons for Facebook, Pinterest, Twitter and Blog on the top right corner, so that you can easily share any item you might want others to see. 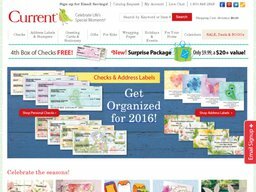 Current Catalog caries a variety of themed check books, address labels and stampers, greeting cards, stationery, gifts, wrapping paper, calendars and essentials for your home. With their wide assortment of products, you will be sure to buy a birthdaypresent that even the fussiest member of your family will love. However, it does not just stop at birhdays, you can purchase a gift for any holiday and event of the year, including halloween, thanksgiving, valentine's day, easter, anniversaries, graduation and so much more. Bookmark this website on your favourite web browser, as you will likely be needing to use it multiple times each year. Whether it is a loved one's birthday, a holiday, or you simply want cute trinkets for your home, you can buy all of these essentials from CurrentCatalog.com. Make buying presents for your family and friends that much better by checking Coupofy for the latest coupon codes before you start shopping. It's quick and easy to use, and the coupon codes will take you directly to CurrentCatalog.com, where you can not only start shopping, but you can also start saving. Payment can be made from a wide variety of credit cards, from Visa, MasterCard, American Express and even Discover card. Current Catalog have a very generous exchange and refund policy, as if you are not completely satisfied with any of their products, all you have to do is contact them within 60 days and they will refund or exchange the item. Current Catalog have many customer service options, so that you can contact them through the method with which you feel most comfortable with. You can contact them through live chat, phone, mail, e-mail and even through fax. Their toll free customer service number is 1-800-525-7170. All of your inquiries and questions will be answered by trained professionals in Colorado Springs, Colorado.